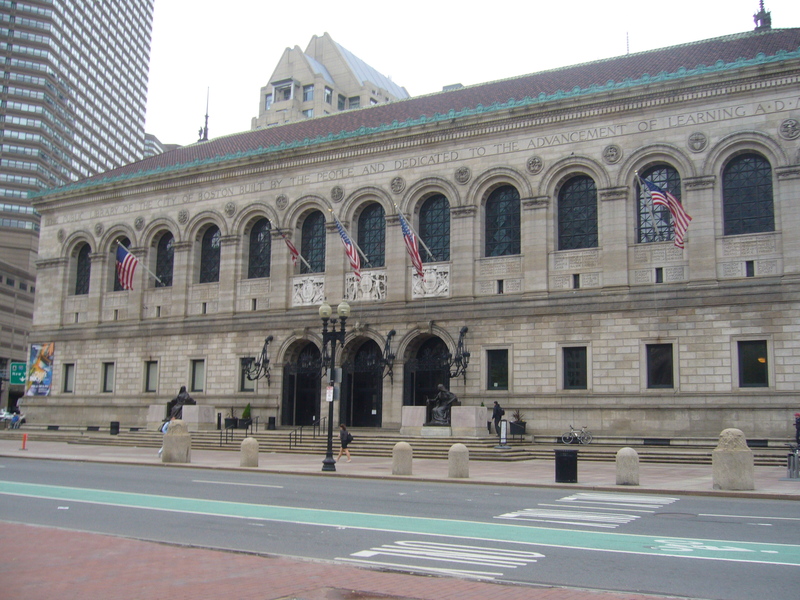 When I arrived in Boston, I gave my friend Avi (who I met in Bulgaria last year) a call. We’d previously spoken through Facebook and he’d kindly agreed to let me spend a couple of nights on his sofa while I stayed here. 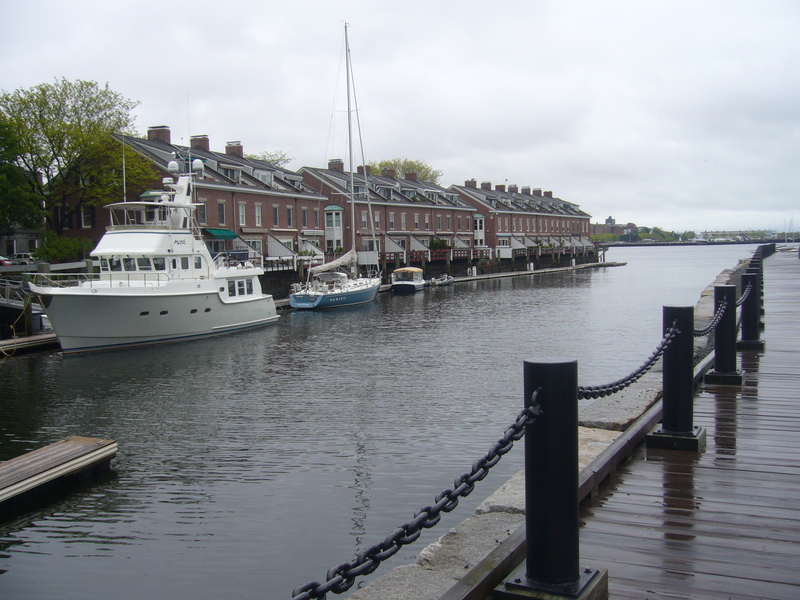 He lived just north of Boston in the city of Cambridge. 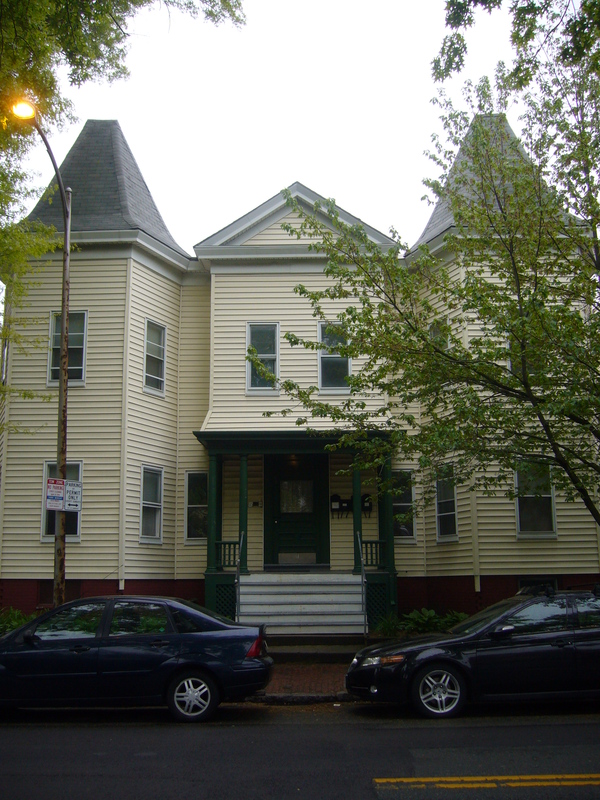 We met up at the Porter Square T station and he walked me back to his apartment, introduced me to his flat-mates and showed me where I would sleep for the next few nights. Once I’d dropped my bags and changed out of my “I’ve been on a bus for four hours” clothes, Avi took me to Red Dee, an excellent Thai restaurant minutes from his place. 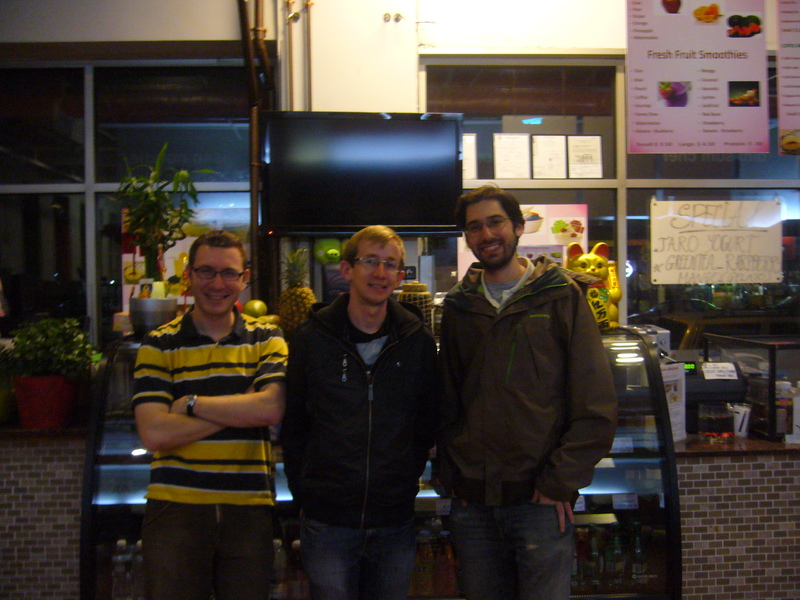 The food was excellent and cheap, and we caught up on what each of us had been doing since we stayed in the YoHo Hostel. Over our meal, Avi explained that he had made the mistake of planning to meet a girl that very night. I told him not to worry and not to let my stay interrupt his plans. Fortunately for me, Avi’s flat-mate Kevin was planning on going to one of the local bars to watch the fifth game of the Stanley Cup play-offs between The Washington Capitols and the New York Rangers and he was more than happy for me to tag along with him. We began in a Tavern, which turns out to be part of a chain of pubs across Cambridge and perhaps beyond. Grabbed a couple of beers and waited for the game. At this point Avi was still with us, debating whether or not he really wanted to go on his date. Eventually he decided, with perhaps a little persuasion from Kevin that he should and he left us. Shortly after the game began and Kevin and I spent the majority of it caught between conversation and the intensity of the match. The series was tied two all before this round and whoever won would take the advantage into the final games. End of normal time and it was one all. Kevin, originally from D.C. was concerned and as over-time began he made a break for the toilets. On his way there, the Rangers scored what I thought was a fairly impressive goal to seal the game. We finished our drinks and Kevin decided we would try another bar and after passing two rather empty places we headed down into what appeared to be an unmarked basement to the Saloon. First impression was this was going to beat the bars and clubs I had visited in New York, and it didn’t disappoint. There was a healthy atmosphere, the other frequenters were predominantly what I assumed were students, although I did challenge one of them to find out if he was actually old enough to be out so late. Kevin and I chilled at the bar, I would say enjoying a couple of PBRs but if you’ve ever tried it, you’ll know it’s not something that is strictly enjoyed but rather endured. We then decided it would be prudent to enjoy a shot, Kevin asked my preference but I insisted that this was his town, he should choose. Right call and right answer; Jaegermeister! However, the bartender made his best attempts to foil our plans by informing us that instead of Jaegermeister they stocked Fernette. If anyone offers you Fernette, politely refuse and leave via the nearest exit and never speak to them again. It is not a substitute, and this was enough for us to try somewhere else. Kevin knew of a place that often had live bands playing, and this to me sounded like the perfect plan. When picked up a beer and headed through to the back room to find Cold Chocolate a bluegrass come funk band four songs into their set. We pulled up a couple of chairs and I enjoyed the eclectic line up including a double-bass and a banjo. Once the bad finished their set, I got chatting to their drummer (by this point, I was substantially drunk enough to not really recall what I said) and came away with a CD, a setlist from that night’s show and a business card. After this, Kevin and I decided to call it a night. The following morning I woke up to find what was becoming standard weather for the trip. By now, I’d given up caring what the weather was doing, got dressed and headed out. 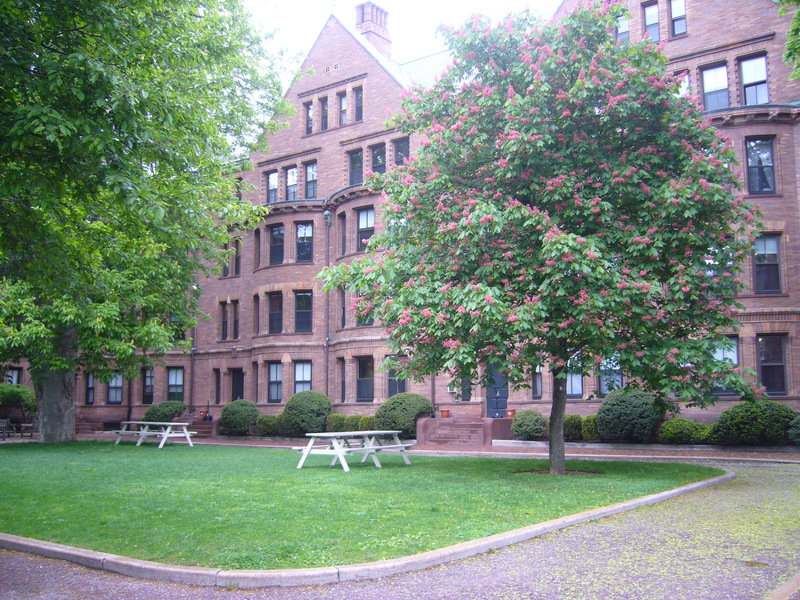 The guys has informed me that I could walk down Massachusetts Avenue to Harvard, follow it onto M.I.T. and eventually in to Boston. 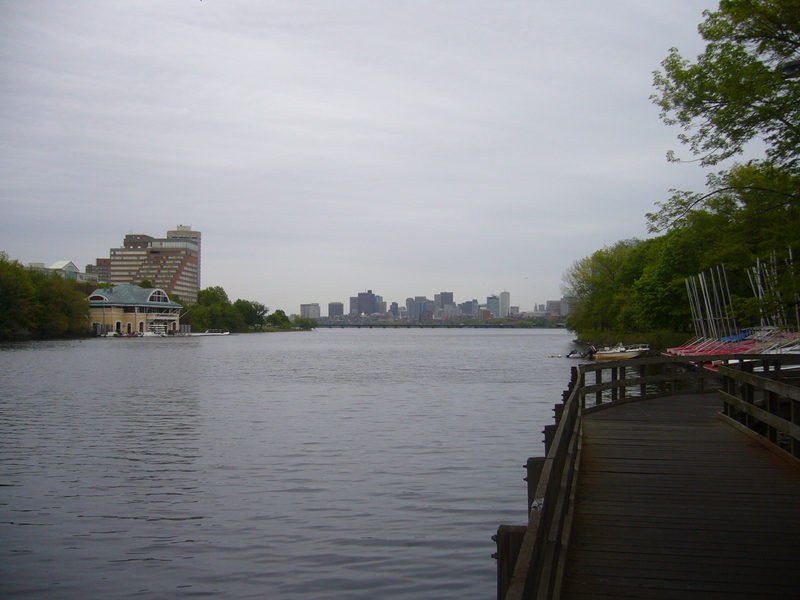 I made it as far as Harvard took a wrong turn and when I eventually crossed the Charles River into Boston found myself quite some way from the About an hour later than planned and I found myself in the Espalande, a large park area that stretches between the river and the city. After walking through here, I decided to save my legs a little and caught the T line (the Boston subway) into Downtown where I picked up some lunch. 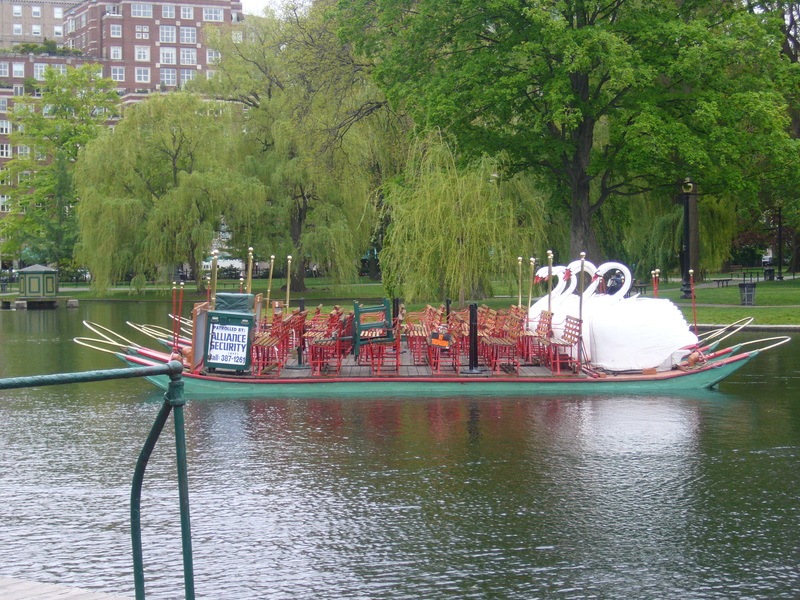 I made my way through the Boston Common and the Public Gardens, stopping to catch a quick snap of the Swan Boats. At the party in New York, one of the girls there had told me that this was one of the biggest attractions in Boston. Interestingly enough, they were moored up in the middle of the lagoon with nobody in sight. After this, I found myself walking down Newbury Street which from the looks of it is the Boston equivalent of Oxford street; shops on every floor of every building on both sides of the road for eight blocks. I got halfway down where I found the Public Library. Both Avi and Kevin had said it was worth a look, so I walked in. Part of the building looks incredible, retaining it’s colonial charm and I was drawn in, in awe at the imperial¬ styled bookcases and writing desks. 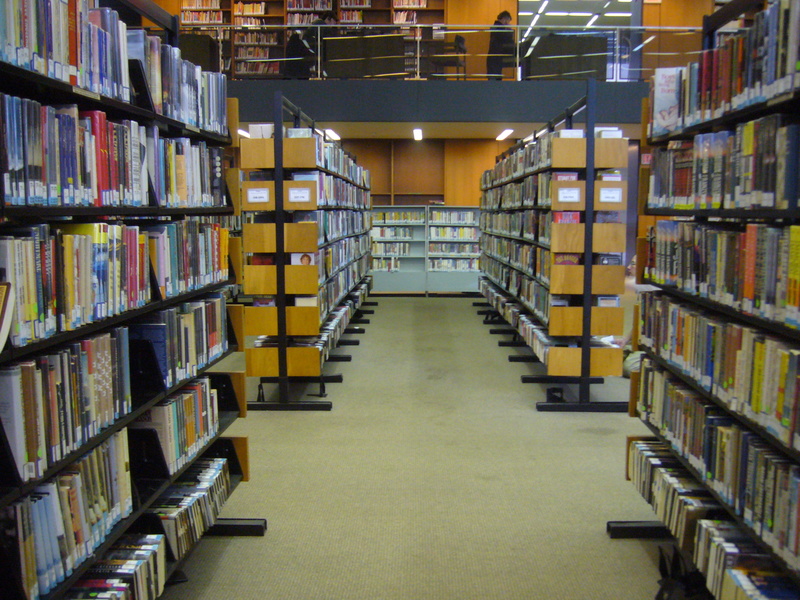 A much larger section of the library is contemporary but holds one of the largest collections of books I have ever seen and enjoyed browsing my way through the floors. Eventually, I quit for Newbury Street again which lead me back to Massachusettes Avenue and I felt that I’d been on my feet long enough to make my way back to Avi’s place and this time I knew I couldn’t miss M.I.T. and I succeeded in finding my way back. That night I decided that I must have eaten something that didn’t agree with me over the past twenty four hours, spending a good portion of the night with my head in a toilet. I found this rather frustrating as it meant I didn’t get much sleep and struggled to eat the following day and spent most of it in bed. When I did finally manage to convince myself that I couldn’t let sickness prevent me from seeing more of the city I made my way to the North End and Boston’s harbour. I followed the harbour walk down the east side of the city, managing to hold down an apple and a cereal bar in the process. Boston strikes me as a very like-able city from my experiences of walking through it but the council seem to only really cater for tourists in the summer. A lot of places that I came to, most frustratingly for me the Boston Tea Party museum, were closed for renovation as it was the off season. Once I had made it this far I decided I’d had enough and my body was not to happy that I’d pushed it this far and so I headed back to Avi’s place and passed out on the couch for a few hours. Kevin got back from work to find me asleep, and asked if I’d been there all day as I was exactly as he had left me earlier that morning and I convinced him that I had managed a brief outing into the city before deciding that sleep was going to be of more use to me. We hung out until Avi returned from work and Kevin asked us if we wanted to join him in going to the Shambhala meditation centre for an open house night. When we had been out together Kevin had told me he’d been practising Buddhist meditation for several years and this struck me as another “when am I going to get this kind of opportunity again” moment and I said I’d be pretty interested to see what it’s all about. 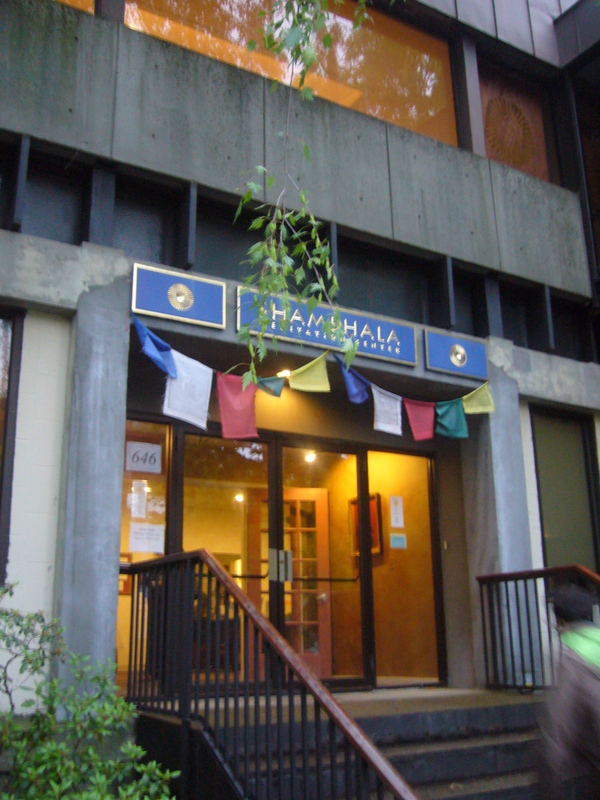 We headed across the city to the centre and Kevin explained that he’d be going with the group of regulars and that there was an instruction group and that I should join them to learn more about Shambhala meditation. This was a pretty unique experience as I’ve never had any dealings with any forms of Buddhism be it in writing of in physical practice. 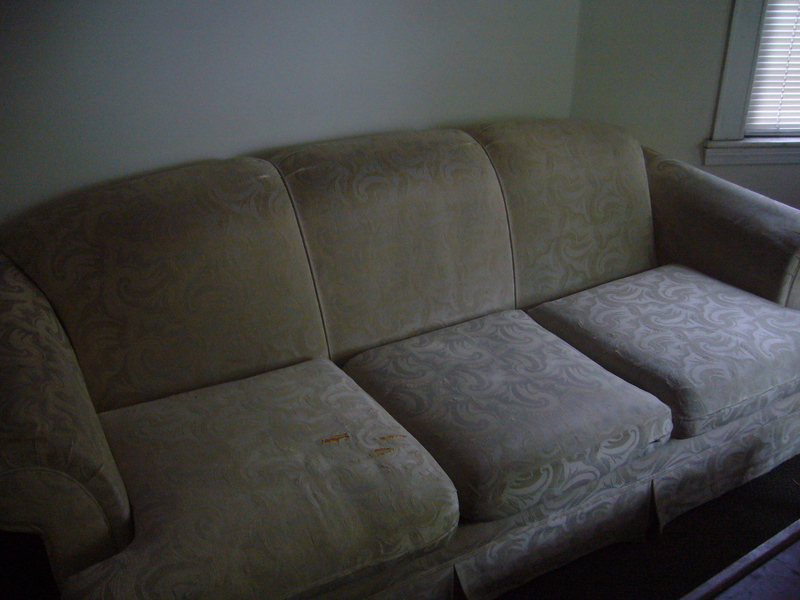 A small group of us were led into a room where we found cushions. Our instructor, John, guided us to be seated and began by talking us through posture, crossed legs, a straight back and open arms placed on your thighs. He then talked us through how to begin the meditation process by taking a tour of your body from head to toe, releasing any tension that you find along the way. Next, we were told to pick a point four to six feet in front of us and focus upon it. The final step was to give our breathing bare attention, to be aware of the way it feels, whether it was in our abdomen, our chest across our lips or through our nose. If our minds drifted away, we were encouraged to accept this without judgement and then find our way back to our breath. Skeptical as I am, I came away from this experience feeling unusually relaxed. When you’re used to constantly thinking about whether or not you booked the bus on the right day, or if you’re actually booked into a hostel when you’re in the next city, or even what you’re going to do with yourself when you get back home, to be able to let go of all of this was incredibly refreshing. I was certainly glad I’d had yet another opportunity to try something new. Boston was a treat, if a little marred by sickness and it was awesome to catch up with Avi and laugh over our memories of Bulgaria. It was incredibly decent of Kevin to take me out and he made me feel more than welcome in Avi’s absence. Next stop, Montreal!